Yesterday, a week-long protest by the Gzira Local Council – following an alleged attack on one of its councillors – came to a close with a public demonstration against the “egoism and negligence of certain contractors working within the construction sector”. The protest began on Friday, when the council closed its doors after one of its members – Jeremy Cardona – claimed that a certain contractor had tried to run him over in broad daylight. Footage of the incident has since emerged, in which the driver, who was identified by police, is seen revving his vehicle and swerving, almost hitting Cardona as he walked along The Strand in Gzira. In a subsequent statement, the Malta Developer’s Association appeared to confirm the attack: claiming that “the incident was not related to any specific development, but was more of a personal tiff between the contractor and the Local Council.” However, in view of the fact that Cardona himself has filed a police report, it would be best to leave the police investigation to reach its own conclusions regarding exactly what happened. What it more important than the individual incident, is the backdrop against which the protest took place. Local Councils are unlikely to resort to such drastic action over a single, unprecedented event: no matter how extreme. The Gzira’s council’s decision to close for a week, and re-open after a public demonstration, must also be viewed in the wider context of a long-suffering community that is constantly exposed to the ill-effects of over-construction... and which, in any case, has often complained about such issues in the past. This emerges from its own statement: “The Council feels that this act occurred due to egoism and negligence of certain contractors working within the construction sector. Such actions are causing considerable inconvenience to residents.” Even if the alleged attack represents an extreme example... there can be little doubt that the ‘egoism’ and ‘negligence’, alluded to above, exist in other, less immediately violent forms. All too often, we still hear of regular cases where residents – especially the elderly, or people with mobility issues – are trapped in their own homes by inconsiderate development; or where multiple streets, within a narrow radius, are blocked by cranes and bulldozers. On top of the inconvenience – sometimes extending to danger – this poses to residents, there are other long-term health considerations: dust and particulate matter may cause respiratory issues; prolonged exposure to deafening construction noise must surely take its toll. And while there may be policies and regulations in place to minimise these problems... it remains a fact that the construction and development lobby still wields disproportionate clout, in a country which economically depends on this sector so much. Meanwhile, it is equally evident that communities – in Gzira and elsewhere – are beginning to feel exasperated by the situation. 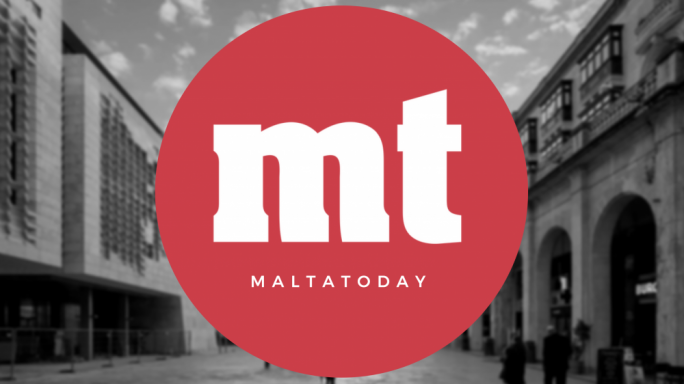 Similar public protests have been held in Naxxar, Pembroke, St Julian’s, Sliema... while the Planning Authority has been singled out for specific demonstrations, such as the one against the approval of the Townsquare Project in Sliema. From this perspective, yesterday’s demonstration in Gzira assumes greater relevance than a one-off event. It is also reflective of a deepening national concern... which has even been registered in our most recent survey. The effects of construction, in fact, emerge as a single category of concern in their own right, within the top four national concerns. And when coupled with the environment in general, the issue is catapulted to the number two spot, immediately below traffic... and there is room to argue that traffic, too, is in part related to the same problem. Certainly, the ongoing construction drive in so many parts of the island is not conducive to smoother traffic flows... especially in areas that are congested and overdeveloped anyway. 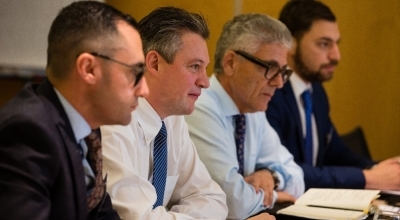 Faced with mounting pressure to somehow rein in the excesses of this one industry – and in spite of its own pre-electoral pledges to safeguard the environment – Joseph Muscat’s government has so far stolidly refused to acknowledge the emergence of this new national concern. This, too, may be fuelling the apparent groundswell of unrest associated with over-construction... for the wave of protests and anger are not directed solely at the developers themselves. There is now growing evidence of discontent with the political/economic system that feeds this monster in the first place. 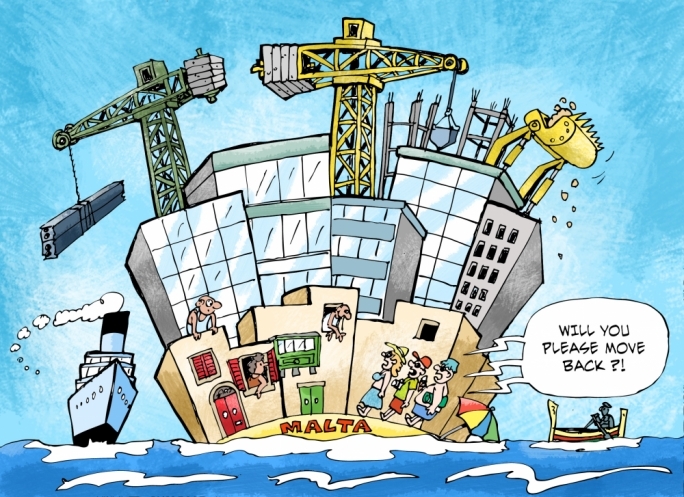 All too often, public concerns are brushed aside by reminders of Malta’s record economic growth figures... but while ‘economic success’ may appear to be a feather in the government’s cap, it is also a crude reminder of the price our nation is paying for such results. People are slowly beginning to question the intrinsic value of an economic boom, which translates so directly into a lowering of their own quality of life. More pertinently: with the Labour government showing no signs of willingness to put any form of brakes on growth figures, the impression many people will surely get is that GDP – as an end in itself – matters more to government, than people’s general happiness and comfort... or even, for that matter, their safety. The bottom line, however, is that economic growth is not an end in itself. In the end, something will have to give.